Living with Lupus: How Does Lupus Affect the Body? With lupus and other autoimmune diseases, the immune system begins to recognize and attack itself, going after and injuring healthy tissue. This can cause several complications as well as inflammation throughout the body’s various systems. Because lupus can affect nearly every part of your anatomy, it is a difficult disease to diagnose, predict the progress of, and treat. It is also quite common to have lupus in combination with other connective tissue or autoimmune diseases. When this occurs, it is often called an overlapping disease, which is one of the main reasons that lupus can be so difficult to diagnose and, all too often, misdiagnosed. 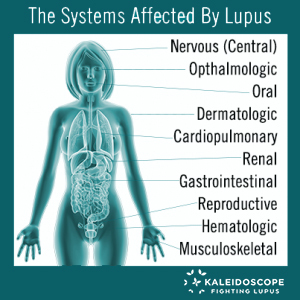 For more detailed information on how lupus affects the body within these symptoms, please see our blog Living With Lupus: In What Ways Can Lupus Affect the Body? While lupus is a lifelong disorder of the immune system with no cure, there are treatments that can minimize the damage that lupus causes to the body. Coping with Lupus: How Does Lupus Affect Your State of Mind? Whether you have been recently diagnosed with lupus or have been living with it for many years, learning to cope with a debilitating disease is not an easy task. The ways in which this disease can physically and emotionally affect a person varies widely from patient to patient. One element that is consistent when coping with a chronic illness, like lupus, is the undeniable toll that it takes on the mind and body. There are many challenging feelings that will be faced and it is important to know that all of them are normal. Power to cope comes from gaining the understanding of where feelings of frustration are stemming from so you are better able to develop techniques for coping. With the right tools, support and education, you can ultimately lead a positive and productive life with lupus. It is important to allow yourself to accept the feelings and emotions that you may be experiencing and acknowledge that you have good reason to feel this way. But know, too, that even though you may feel powerless, you do still have power. Living and coping with lupus or any other chronic illness can be difficult, but by learning proper techniques and tools for coping, your life with lupus can still be positive and productive. Our blog page has more than 100 blogs that discuss topics relating to living with a chronic illness, parenting when sick, lupus, overlap diseases and much, much more. Please find them by clicking here. Click on the link to learn more information about lupus symptoms and signs.